Many people celebrate the Lunar New Year including Taiwan, China, Korea, Singapore, Malaysia, Laos, and Vietnam to name a few. With the melting pot or salad bowl that we live in today’s diverse society, many more peoples are included in the celebration. We love sharing the festivities and everyone is welcome whether you grew up in the culture or not. Lunar New Year schedules the beginning of the year based on the calendar of the moon rather than the sun. In many cultures, the beginning of these cycles differ. In Tibet, the New Year is celebrated with the first month being one month later than the majority East Asian cultures. Still, many cultures agree that each year is meaningful to a certain type of person. Rat, Ox, Tiger, Rabbit, Dragon, Snake, Horse, Sheep (Goat), Monkey, Rooster, Dog, Pig. 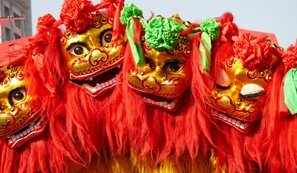 The Lion Dance is the most famous Chinese New Year celebration dance. At almost every Lunar New Year festivities. Chinese Theater Dance combines martial arts, acrobatics, ballet, and folk dance. Specifically, Kung Fu elements are the most used movements in a Lion Dance. The Lion is made up of a few dancers who pantomime the actions of a lion. When this dance first originated during the Han Dynasty, there were not many lions in existence in China. So in essence, they were revered like the mythical dragon. The Lunar New Year a great time to also showcase Asian cultural dances, Pan-Asian dances, Asian Diaspora dances. From the Phillippines, Japan, to Hawaii, I have enjoyed participating as both performer or audience member in any of its celebrations. Happy Lunar New Year!